The College of Engineering and Science at Victoria University understands that hand dexterity performance is extremely important for the safe riding of motorbikes. That is why the College joined forces with Racesafe Australia to produce a force-sensing glove system that can provide safety feedback to riders. Most of a bike’s functions, such as steering, adjusting the throttle, and using the front brake or clutch, are controlled with the rider’s hands. Therefore, the performance of hand dexterity becomes vital for riding safely. Even the slightest change in control inputs can lead to a loss of the control of the bike. Racesafe Australia has created a force-sensing glove system that collects and shares real-time data with riders. This was made possible due to the collaboration between Racesafe Australia’s director Mr. Simon Maas and research director, Dr. Greg Harris and Dr. Daniel Lai and his research team at Victoria University. This system required unobtrusive force sensors to prevent interference with the rider’s natural movement. The engineers selected FlexiForce™ sensors for their grip application due to the flexibility, thinness, and lightweight construction of the sensors. In their initial prototype, they applied four FlexiForce A401 force sensors to each glove and wirelessly interfaced the sensors to a smart phone using Bluetooth. The two sensors were placed on the index finger and the middle finger to monitor two-finger braking activity. The sensors placed on the thumb and the palm recorded the rotation of the throttle. The system can recognize hand activities based on the force feedback from the sensors. The engineers created a innovative dynamic calibration method and a series of data classification algorithms to give accurate hand performance feedback to the rider. 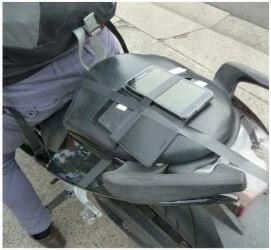 The prototype makes the feedback of the ride immediately available to the rider on their smart phone. The phone converts, records, and displays the force data. The engineers are interested in providing real-time, active feedback and plan to research ways to deliver it without causing distraction to the rider. The test results of the prototype show that the system can provide accurate feedback in a natural environment. 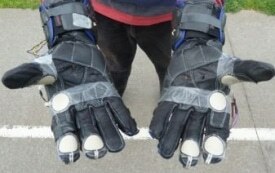 The engineers have since embedded the sensors into gloves, which has made the system more durable. Engineers are also currently working on improving the design and eventually launch the product to the market. (1) Cai, Zibo; Lai, Daniel T. H; Seyedi, MirHojjat; Ye, Qiang. International Journal of Distributed Sensor Networks. (SAGE Journals, 2015). 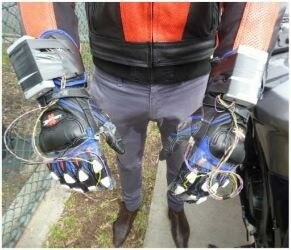 Force-Sensing Glove System for Measurement of Hand Forces during Motorbike Riding.